Online counselling. Counselling to improve feelings. Building Confidence – Ivana Straska, M. A. Solid confidence is nothing tangible but something necessary people need to smoothly move through life and do it with joy. Confidence is one of the psychological assets allowing utilizing skills and potential. The most important thing to remember is that nobody was born with confidence. Confidence evolves from moments to moments by valuations and actions. Through experience people learn to think and feel somehow about self. In self-reflection they assess behaviour, feelings and compare them with their values. The problems starts when people negatively validate and they don’t believe. To have solid self-confidence people must positively assess personal actions in harmony with their optimistic beliefs. Confidence rises from personal values and actions. Building confidence requires balanced thinking and understanding personal values. Once a person realizes they miss confidence they can boost it by constructive thinking and beneficial decisions they act upon. Confident people don’t think of mistakes as problems rather as learning opportunities. They choose and learn from confident people. They let their confidence “rub off on them”. After people become more confident they offer advice and help. When confident people become role models their confidence strengthens. Low confidence is maintained by thinking errors and negative attitude. 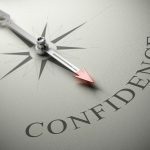 Except of thinking confidence is affected by other factors such as unhappiness, lack of knowledge, poor time management, missing skills, negative experience or perfectionism. Other feelings can support confidence or banish it. People with low self-esteem generally lack confidence. Sometimes they are confident in specific areas (for instance perfectionists). Confidence improves through increased values (found in self), learning, problem solving and decision making. Naturally people feel less confident about the unknown, new or potentially difficult circumstances. Nothing else can help more than the positive mindset and actions. Planning and preparation are good strategies to lessen the impact of the unknown and something new. Once people are prepared their confidence increases. Achievements and some level of competence reinforce confidence. Working with beliefs in personal competence always speeds up the development of confidence. Through positive beliefs people express trust, willingness to dedicate and have discipline. Confidence develops with desire to improve along with the process of accomplishment. Learning and developing new skills are opportunities to accomplish something new which enhances positive beliefs in personal capacities. The basic rules are to highlight strengths, learn from mistakes and work towards improvement. Positive attitude allows focusing on confident progress. Once a person achieves the confidence brought with it can be indisputable and positive for self-esteem.